These data sets contain the sensor data collected by the Navlab11 testbed. By sharing these data sets with the the community, we aim to facilitate the development of localization, mapping and moving object tracking algorithms. Loop 1: From Henry St., right on S. Craig St., right on Winthrop St., right on S. Dithridge St., right on Henry St., repeat twice. 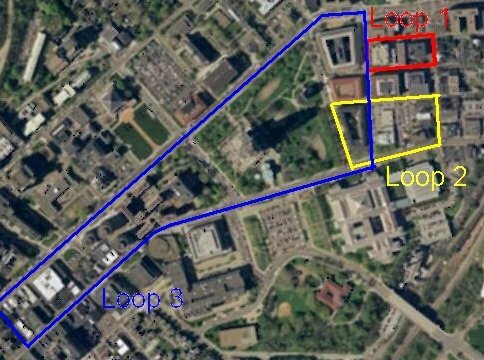 Loop 2: From S. Craig St., right on Forbes Ave., right on S. Bellefield Ave, right on Filmore St.
Loop 3: From Fifth Ave/S. Dithridge St. towards town, left on Meyran Ave., left on Forbes Ave., left on S. Dithridge St., repeat once. The Aerial Photo is downloaded from and the copyrighted property of GlobeXplorer, LLC. ("GlobeXplorer"). The attached file readdata.m includes a Matlab routine illustrating how to read the data files. 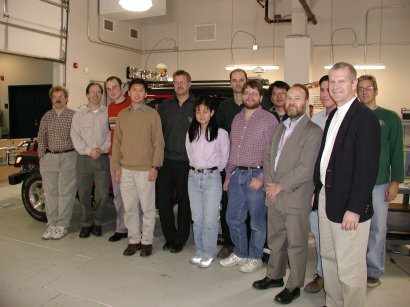 C.-C. Wang, D. Duggins, J. Gowdy, J. Kozar, R. MacLachlan, C. Mertz, A. Suppe and C. Thorpe. Navlab SLAMMOT Datasets. Carnegie Mellon University. Copyright 2001-2004 by Carnegie Mellon University. All rights reserved. Carnegie Mellon University, Pittsburgh, PA, U.S.A.
Radish: The Robotics Data Set Repository. Copyright © Chieh-Chih (Bob) Wang 1999-2004. All right reserved. Last Updated: May. 10, 2004.